It is a real pleasure for me to join you at your Chinese New Year Dinner. I want to thank the Cities of London and Westminster Conservative Association for its gracious hospitality. For simplicity I will follow your style and call you CLWCA! 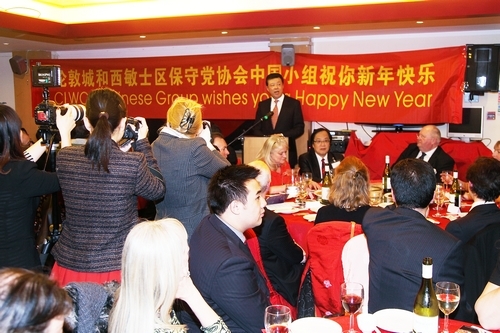 In the past three years the HSBC event was usually the last Chinese New Year celebration in Britain that I would attend. This year has been an exception. A few hours ago, I was at the HSBC Chinese New Year lunch. Now I am with you at the CLWCA Chinese New Year dinner! So we can say this is an important wrap-up of Chinese New Year celebrations in the UK. Over the past month, the convivial atmosphere of Chinese New Year has permeated the UK! Since we ushered in the Chinese New Year, I have attended more than a dozen celebrating events. From England to Wales; from Buckingham Palace to Number 10 and to the Palace of Westminster, and from the Lyceum Theatre to Trafalgar Square. The Chinese New Year, also known as the Spring Festival, is now more than a traditional Chinese festival. It has also become an important festival in Britain. I believe there are three main reasons for its growing popularity. · More and more British students start to learn Chinese language. · More and more British schools open Chinese language courses. · More and more Chinese restaurants of various flavours spring up across Britain. · More and more Chinese tourists appear in British shopping malls and places of interest. · As a result the British public has become more and more acquainted with the Chinese culture. · Chinese British are active in all sectors and professions. · They have actively integrated with local people and live in harmony with other ethnic groups. · They have played a positive role in Britain’s economic growth and China-UK friendship. · Two weeks ago I attended the Chinese New Year reception at Number 10 hosted by Prime Minister Cameron. He spoke highly of the contributions of Chinese communities in Britain. The third reason driving these celebrations is a rise in knowledge about China. All sectors and circles in Britain now have a deeper understanding of the importance of China-UK relations. 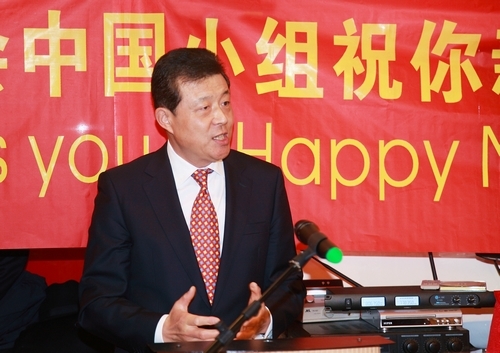 · China-UK bilateral trade last year passed 60 billion US dollars. · During 2012 the UK was the only European country that enjoyed growth in both exports to and imports from China. · Britain now is host to 120 thousand Chinese students. This is the largest foreign student community in UK. · When Winston Churchill was the Prime Minster, China and UK exchanged charge d’affaires. · During the office of Prime Minister Heath, the two countries established ambassadorial diplomatic relations. · Under the Premiership of Margaret Thatcher, China and UK signed the joint declaration on Hong Kong. Although the incumbent government is a coalition, the Conservative Party undoubtedly is the leading influence of Britain’s current China policy. You are the main policy makers and implementers. It is our wish and hope that new and greater advancements in China-UK relations will be made with the Conservative Party in power. How to make this wish come true merits deep thinking of today’s Conservative leaders in government. It also needs contribution and support of Conservative members of Parliament and organizations like CLWCA. This new year is the year of the Snake on Chinese calendar. I know that the snake is not a lovable creature in your culture. However, the snake in Chinese culture symbolises longevity, prosperity and wealth. In that spirit I hope the ‘Year of the Snake’ will bring new progress in China-UK relations. I also wish all of you good health, happy families and successful careers in the year of the Snake!